JANE CARROLL celebrates 26 years as a visual and poetic artist. Important visual influences include the work of Goya seen at the Prado Museum in Spain and tree drawings of Mondrian going through the birth of abstraction at the Guggenheim Modern Art Retrospective in NYC. Other influence serving as fundamental in the formation of visual ideas is the concept of Universal Space. Ancient Chinese Art first depicted this concept and the evolution can be seen in the works of El Greco, Raphael, Cezanne, and Matisse’s “Joy of Life” and can be traced through the visual marks of interlocking and overlapping planes, the “meeting of planes” seen in Cezanne, and the “fragmentation (of planes) help to define space” (Braques). Other rudimentary art concepts unearthed in caves, Indian American Wall Markings, and early African Sculpture have been incorporated and synthesized into contemporary culture communications through Master works of Modigliani, Picasso and others. Having been redeemed often by the out of doors the “plein air” drawings of Corot, Monet color and application of paint, Cezanne paintings, watercolors and pencil drawings and Van Gogh’s expressionism and use of color help to serve as models for “following the gleam” found in nature. Esteemed teachers and mentors of importance include Dolores Kennedy, Nancy Honea, Jim Shell and Mark Chatov of Atlanta. Nelson Shanks of Philadelphia, and Daniel Green of New York. CAREER ACHIEVEMENTS include a one person exhibit entitled Homecoming with the Greenville Symphony and the Revis Lewis Gallery Greenville SC 2002. Other one-person exhibits beginning in 1989 include The Atlanta Galerie of Timothy Tew and Ariel Gallery at Tula on Bennett 1995. Showings at the Telfair Museum Art Fair include 2007, 2006, 2004, 2002, 2000, 1995. National publication listings include Who’s Who in America 2009, 2008, 2007, 2006, and 1999, Who’s Who in U.S. Writers, Editors and Poets 1988. Authored publications include Church and Society, National Publication Presbyterian Church USA 1999. Winston Derek Trade Publications Art and Poetry 1986-87. Selected awards: Inclusion in the Governors’ Permanent collection of Georgia Authors 1988. First Place Drawing, Savannah National 1993. Best of Show, Atlanta Branch, National League of American Pen Women 2003,2001,1987. National Juried Art Exhibition South Cobb Art Alliance 2000,2003 Merit Award. JANE CARROLL landscapes, portraits and fine art commissions are housed at corporate headquarters, in private collections and in charitable agency collections. Other notable showings include Sumner Museum and Archives Washington DC Fine Arts Museum of the South, Mobile Alabama and Marietta Cobb Fine Art Museum, Marietta, Georgia. 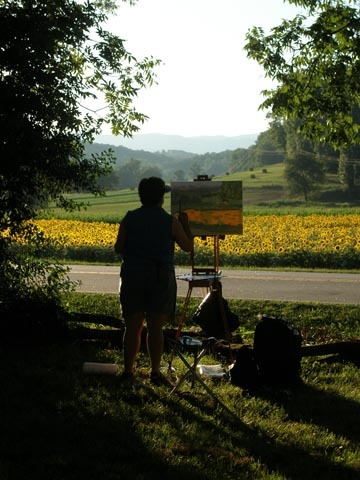 Jane Carroll painting in the field.